His roommate and teammate Dave Bing was Syracuse's greatest basketball player ever; Jim Boeheim IS Syracuse basketball, having been associated with the program for over 50 years as a player, assistant coach, and head coach. 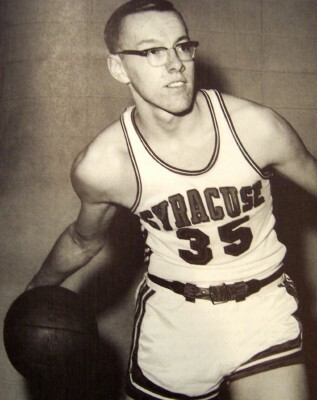 Jim Boeheim was a skinny walk-on in 1963, who impressed coach Fred Lewis with his determination and earned a place on the squad. By time his junior year rolled around he had earned a scholarship and a starting position in the lineup, sharing the backcourt with the legendary Bing. During his senior year he averaged 14.6 points, and helped the team reach the Elite Eight of the NCAA tournament. Boeheim was also an excellent golfer, and lettered on the Syracuse golf team in 1964 and 1965. Upon graduation, he played minor league basketball for a few seasons with Scranton in the Eastern Basketball League. He helped lead the team to league championships in 1970 and 1972, before returning to Syracuse as a graduate assistant basketball coach under Roy Danforth. At the same time he was the varsity golf coach, a sport that Boeheim excelled at. In 1972 he became an assistant coach under Danforth, and remained in that position through 1976. Syracuse made their first trip to the NCAA Final Four in 1975, while Boeheim was an assistant. 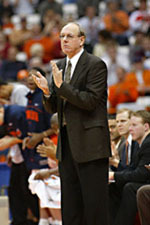 Roy Danforth stepped down at the end of 1976, and Boeheim landed his dream job, as head coach of the Syracuse Orangemen. During his first four years, the team would go 100-18 (winning 85% of his games). Boeheim had one successful team after another, winning 20 games a year like clockwork, yet had earned a reputation as "not being able to win the big games". In 1987, that reputation changed as he took a young team to the NCAA Championship game, losing to Bobby Knight's Indiana Hoosiers on a last minute shot by Keith Smart. In 1996, he once again took an underrated team, led by John Wallace, to the NCAA Finals, losing to highly favored Rick Pitino's Kentucky Wildcats in a close game. 2003 would change everything, as the Orangemen, behind the irrepressible Carmelo Anthony, the sharp shooting of Gerry McNamara, and 'the Block' by Hakim Warrick, would beat Roy William's Kansas for Syracuse to win its first NCAA Tournament Championship. In 2010 and 2012 Syracuse was considered a favorite to go to the Final Four, but costly injuries derailed those hopes. 2013 had different expectations as the team struggled to find an offensive identity, but demonstrated an outstanding zone defense. Boeheim would make his fourth Final Four as a head coach that year behind a zone defense that was the talk of the media. Michael Carter-Williams, C.J. Fair, Brandon Triche and James Southerland led the way to the Final Four where Syracuse would lose to a talented Michigan team. Boeheim was never a media darling, often with sharp tongued whiplashings for reporters he thought asked stupid questions. He had a demeanor on the court as being whiny. But he was well respected by his peers, and was competitive as any player or coach on the court. A survivor of prostate cancer, he was actively involved with fund raising in the Coaches vs. Cancer Foundation. His teams traditionally played a strong matchup zone, unique during most of his coaching tenure. As a result he tended to favor lanky players as opposed to the bulkier players other teams had. When his personnel dictated, he did use different defensive schemes, such as a pressure trap defense, used well during the late 80's. Offensively, his teams ran very few set plays. Boeheim preferred to have the point guard break down the defense of the other team, and have his players work to get open for shots. In the 70's and 80's his teams ran a fast break offense, making them one of the highest scoring teams in the country; from the mid 90's on, the teams tended to settle more into half court sets. Regardless on how he ran the teams, they always seem to win. Syracuse was 52-24 when he was a player, 139-65 as an assistant coach, and he's still working on that head coaching resume. He has been involved with all six Syracuse Final Four teams. He was the only coach for Syracuse in Big East play, winning more games than any other coach in Big East history with 366. Syracuse named the basketball court at the Carrier Dome after Jim Boeheim. He is the winningest coach in Syracuse history, the winningest coach in Big East basketball history, and one of the winningest coaches in NCAA Basketball history. He was named the Big East Coach of the Year four times. He was inducted into the College Basketball Hall of Fame in 2005 and the Syracuse Sports Hall of Fame in 1989. He would have his 3lst 20-win season in 2010, an NCAA record for men's basketball. In 2010, after Syracuse had an improbable 30-5 season, he was named the USBWA, AP, and Naismith Coach of the Year. Boeheim became involved with U.S.A. International basketball and would work for the U.S. National team with Duke's Mike Krzyzewski. Boeheim would be an assistant coach on U.S. Olympic Gold medal teams in Beijing in 2008, London in 2012 and Rio in 2016. Boeheim would become the third coach to ever win 900 games on December 17th, 2012, when Syracuse beat Detroit 72-68 at the Carrier Dome. Syracuse was found guilty of NCAA infractions in the winder of 2015 after a ten year investigation by the NCAA. Though the NCAA acknowledged that Boeheim likely did not know of the violations, he was stripped of 101 victories, and initially suspended for the first nine ACC games of the 2015-2016 season. Boeheim would appeal this decision, and after several months, with two days notice, the NCAA moved his suspension forward to the nine games from December 5, 2015 (Georgetown) through January 5, 2016 (Clemson). Mike Hopkins would assume the head coaching duties during that time frame. Boeheim would earn his 1000th win against Virginia on February 4th, 2017 when the Orange upset #9 Virginia 66-62 at the Carrier Dome.